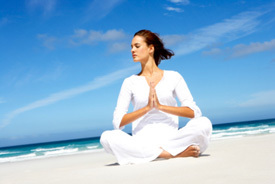 An holistic approach to health must include meditation. Why is it said that laughter is the best medicine? And why is it that in spite of doctors earnest effort’s some patients fail to get well.? A predominant reason is nutritional even though many nutritional supports are given. The answer is that the body produces an unpleasant physiological response to anxiety, fear and anger. If these emotions are continually elicited various neuropeptides are released and travel in the bloodstream throughout the body. These neuropeptides enter receptor sites on our cells and block the absorption of essential nutrients from our food and the cells become damaged. These damaged cells produce other damaged cells and the body gradually becomes sick and diseased. If laughter and joy and ecstasy are not a part of ones daily life these physiological changes stemming from the limbic system occur and life spirals down. This is why meditation has been a part of every culture. It takes one deep inside to the source of all joy and bliss. That deeply quiet place has been called by various names like Nirvana, The Kingdom of Heaven, the no mind state, samadhi etc. Some of the most stressed individuals in society are those in prison. They typically have very high cortisol levels, a stress marker, and very low serotonin levels, the happiness neurotransmitter. When the most serious criminals in our society at Folsom prison in California were taught how to meditate their cortisol levels went down and their serotonin levels went up. The same experiment produce the same results in Senegal. It in fact was so successful that the recidivism rate dropped dramatically and some prisons had to close due to the lack of prisoners. These people became creative enough when released from prison to not have to commit crimes. That state of bliss in meditation, which carries over after the session is done, is totally different from pleasure. We may have great pleasure when we get our new car or a new piece of clothing. But how much pleasure do we still have when the car gets scratched in an accident or a hole appears in that beautiful shirt. Anytime there is pleasure there will be pain whether it’s from an object or a relationship. It is not the events in life that are important. It’s how we metabolize those events that is important. Deepok Chopra. Chopra gave a great example at one of his talks. He explained that he and his son both went and took a roller coaster ride. His son loved it but he hated it. His body produced cortisol while his sons body produced serotonin. They metabolized the same roller coaster ride completely differently. However when there is truly joy or bliss present the scratch in the car or a hole in the shirt is merely just another incident with out any great value. It is the continual assignment of good or bad to events that leads to an unpleasant health related issue. It is the repeated dissociation through meditation of the individual with the ongoing incessant thinking of the mind that allows for the mere witnessing or observation of the events in life rather than the identification with these events that allows for a healthy view of life. The mind is going to continue to think. It operates on its own. It is not you. You do not have to be captive to it. You can however observe it and realize “Oh. This is what the mind does when it sees a police car” or “This is what I look like when I am angry or jealous or fearful.” Merely recognizing that it is the mind doing its thing begins to defuse its power. It is for this reason that an holistic approach to health must include meditation. Isn’t it time you got joyously serious about your health? Meditation classes are free the second and fourth Thursday of each month at 7pm at our office.